Never underestimate this real estate cycle’s intensity. I have been warning readers not to look at the house price charts and conclude anything. We can be wrong for years waiting for housing market equilibrium. Foreign buying, led by the Chinese, is beginning to overwhelm the market while endogenous market factors, like household income and economic growth, are beginning to take a backseat. The numbers out from the National Association of Realtors continue to paint a somber picture for the average American. I came across this article last night, which demonstrates the latest trend in the foreign real estate buying spree. As a licensed Realtor, I have observed that most of the foreigners are performing little due-diligence on their real estate purchases and that many of the transactions involve only cash. 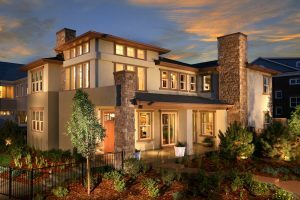 Since real estate is priced at the margin, only a few purchases can drive the market. This is what I am noticing here in Northern Virginia. 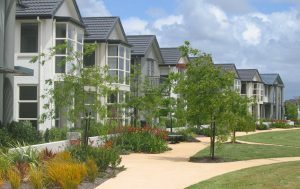 Moreover, many of the homes are essentially taken off the market as they continue to remain vacant. Of course, this plays a part in keeping rents higher. 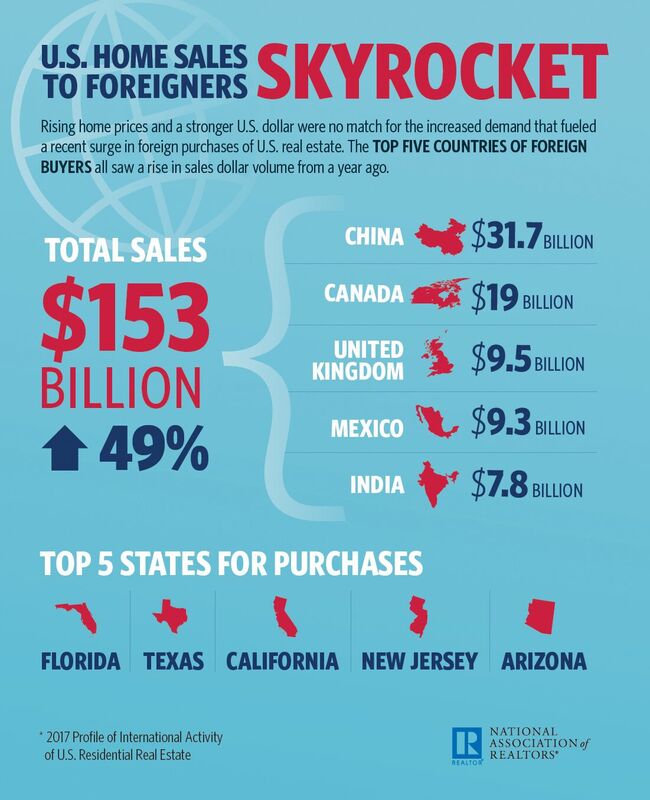 As the article says, foreign buyers purchased 284,455 U.S. homes from 2016 to 2017, with a sizable share of transactions taking place in California, Florida and Texas. Activity on the part of resident foreigners and non-resident foreigners both expanded—the former up 32 percent to $78.1 billion, and the latter up 72 percent to $74.9 billion. When the OPEC producers were flush with dollars during the 1970s-80s, only a small number of individuals controlled that wealth. 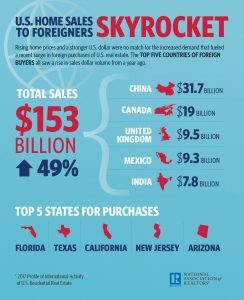 Thus, when these foreigners entered the US real estate market they concentrated on large purchases, such as skyscrapers, malls, and high-end estates. When the Japanese entered the market during the 1980s-90s, they were primarily represented by large corporations, flush with trade-deficit wealth, and concentrated on big-name purchases, such as the Rockefeller Plaza and the Waldorf Astoria. Today, the Chinese buyers number in the tens of millions and are concentrating on residential real estate, the kind you and I own. Thus, I have concluded that the market dynamics driving this cycle are much different that in previous cycles. The average American is competing with these foreigners, and as long as these foreigners have the cash, they control the transaction negotiation. Buyers from China comprised $31.7 billion of the total volume between 2016 and 2017, followed by Canada at $19 billion, the UK at $9.5 billion, Mexico at $9.3 billion and India at $7.8 billion. Home-buying activity originating from Canada was concentrated in Florida, while activity originating from China was focused in California and activity originating from Mexico occurred in Texas. Recall that the Chinese have never had to endure a long-term housing downturn in their homeland. They also think there is only one way for real estate in the United States and Canada. The local residents are now forced to compete with these newcomers. Thus, their debt ratios climb as they need larger mortgages to buy homes. I cannot tell you when this cycle will end but, the amount of foreign money still on the sidelines is staggering. This can continue for much longer than the housing bears realize. So, throw away those charts. If we want to know when this market is going to turn down, we need to analyze when the foreign money will stop coming in and feeding the frenzy. As we can see from the above debt/income chart, the local residents will be the ones left holding the bag.